The eclectic and diverse interests and livelihoods of Kendal at Oberlin residents are on display this summer in the community’s three art galleries. “Kendal Collects,” a biennial show, gives residents an opportunity to showcase framed art work, sculptures, pottery, woodcarvings, quilts and other cherished original works of art from their home collections. “We’re sharing what we care about with the people we care about. And it gives a window into the lives of people you might not know otherwise,” explains Robert Taylor, chair of Kendal’s Galleries. This year’s show includes about 80 items from the collections of 60 residents. Many residents are also artists, but “Kendal Collects” focuses on just works created by non-resident artists. Resident artwork is displayed during “Kendal Creates,” which alternates with the collection exhibit. However, some residents own original pieces created by other residents and are free to include those in the collection show. Thelma Morris, for instance, contributed a Japanese woodblock print made by Oberlin College art professor Paul Arnold, a Kendal resident who died in 2012. A handful of residents always contribute artwork made by family members. This year’s show includes a silk christening dress hand-sewn in 1924 by Eileen Dettman’s mother and a watercolor painted by Larry Porter’s father. “The scene looks over Penobscot Island in Maine. I inherited this piece from my father, Fairfield Porter. His father, James, acquired Great Spruce Head Island in 1911, and four generations have built summer cottages there,” Larry says. Two of the larger pieces in this year’s “Kendal Collects” belong to Katie Brown, who moved to Kendal in 1998. Her husband, John Lott Brown, now deceased, was president of the University of South Florida in the 1980s. The university houses the Graphicstudio, which focuses on research into technical art-making processes and has attracted many well-known artists, such as Robert Mapplethorpe and Robert Rauschenberg. “It was something different in the art world,” Katie says. For this year’s “Kendal Collects,” Katie contributed two gravures: A portrait by Chuck Close and “View of Rome” by Philip Pearlstein. Before Rita Haessly had grandchildren, she had granddogs – Judgie and Chester. At the time, she lived in North Carolina and belonged to an arts cooperative. Rita worked with stained glass, so she asked a painter at the coop to make a watercolor of her daughter’s dogs from a photograph. The artist, who signed her name “Shannon,” (Rita can’t remember her full name), made two paintings of the dogs. Rita kept one, which hangs in her bedroom, and gave the other to her daughter, Lynn. “Chester followed my daughter home. Judgie was found by her husband huddled in a snow bank beside a judge’s parking space,” Rita says. Soon after the paintings were complete, Rita became a “real” grandmother. 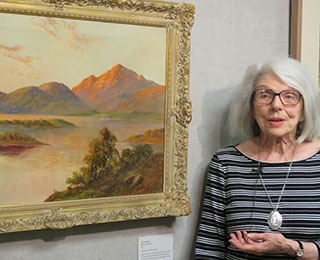 An oil painting titled “Scottish Highlands” has been a part of Barbara Bruer’s life since she was 10 years old and living in Oak Park, Illinois. “I was an only child so I went everywhere with my parents. I had been to museums but never to an art gallery, so this first visit was very exciting,” she recalls. Barbara has traveled to Glasgow and hopes to return to Scotland next year and visit more of the mainland.